A dashboard is a screen that provides at a glance, updated information that you find useful. Learn how you can create such dashboards in PowerPoint. PowerPoint makes amazing slides, but it is more than a program to create slides for presentations. Did you know that you can create some amazing dashboards in PowerPoint? Your dashboards are easily created, edited, maintained, and even distributed if you need to. Plus, your audience can easily glance and grasp the essential information about the topic you choose. Lead them back to where they came from, or even lead somewhere else. 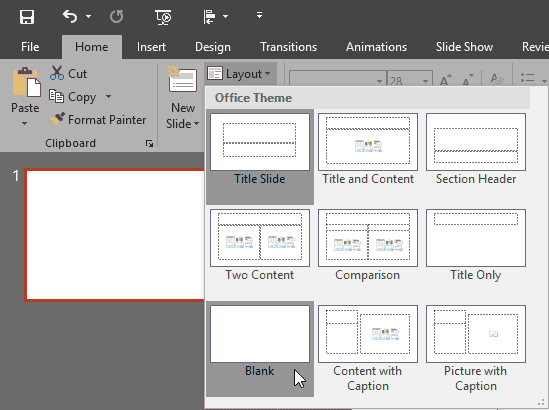 Beyond connecting to other PowerPoint slides, these elements can be connected with content from other Microsoft Office programs, letting you easily import and thereafter update information with a few clicks, or even some right-click options! 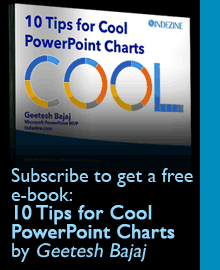 First, create a new presentation in PowerPoint. Typically, your new presentation will have just one slide. Access the Home tab of the Ribbon, choose the Layout button to bring up a dropdown gallery, and choose the Blank layout option, as shown in Figure 1, below. The easiest way to populate your dashboard is to access the Insert tab of the Ribbon, and then click the SmartArt button. This will open a gallery of templates, flowcharts, timelines and shapes that you can use to summarize your data so that it is more interesting for your viewers. There are many options that you can pick from. To add one to your slide, you will need to select it by clicking on it, and then click the OK button (see Figure 2). In the Insert tab of the Ribbon, you will find many more options. You can also add your own images by clicking on the Pictures button. This opens a selection box, so you can browse and choose images you want to use in your dashboard. Do You Need Free Images? Who doesn’t want free images? If you are part of the free club, look at our Free Images & Textures page. Another awesome resource we use is StockUnlimited, which is not free. However, it is a very low-cost option. When you are adding images, SmartArt, or even charts on your PowerPoint-based dashboard, you will have the option to move them around the slide, or even resize as needed. You may end up with something similar to what you can see in Figure 3, below. Text is important due to more than one reason. First, text can help explain what you are showing within your dashboards. Text can also be used to create buttons to move viewers around the dashboard slides. Finally, text can be used for titles, subtitles, and captions. To add text, revisit the Insert tab of the Ribbon, and click on the Text Box button. The text box you create can be any size you want. Other than the text box, you can also choose the font you want. You can also resize and recolor fonts. If your dashboard needs to be distributed, ensure that you use common fonts that are typically available on most systems. If you want to import information from other Microsoft Office Programs, the fastest way of doing this is by opening the file that you would like to copy from and selecting the information to copy and paste into PowerPoint. You can thereafter link to the original file by selecting the pasted content, and then clicking on the Hyperlink button found again in the Insert tab of the Ribbon. Windows users can use the Ctrl+K keyboard shortcut (Mac users can press Cmd+K) to summon the Hyperlink options. Keyboard Shortcuts Make You Faster! You can also link to websites and other slides using this method. The Hyperlink tool is very helpful when you need to link between your dashboard slides. Most importantly, you can use tools such as DataPoint to access content from Excel and other data sources to show up in PowerPoint. Once your first dashboard slide is done, you will need to create more slides to provide more information on a subject. You can use the New Slide button on the Home tab of the Ribbon, or press the Ctrl+M keyboard shortcut (Mac users choose Cmd+M). Figure 4 shows a dashboard slide created entirely in PowerPoint. Designing more slides that you can use to create your dashboard in PowerPoint needs both time and patience, but the results can be rewarding. You can use the same ideas that you used to create your first slide. You can connect this slide with other slides using the Hyperlink options. Each slide created should be linked back to the original slide, and other important slides, so as to make using the finished dashboard easy and intuitive. In the Show type area, select the Browsed at a kiosk (full screen) option. This will ensure that only hyperlinked clicks work, and your slide does not navigate to the next slide with a conventional click. In the Show options area, select the Loop continuously until Esc option. In the Multiple monitors area, you may want to turn off the option for Presenter View. You will now need to click on the From Beginning option in the Slide Show tab of the Ribbon to view your completed dashboard. You should make sure that everything is working correctly when it is being viewed in full-screen mode, so all the clickable areas should link to the right page. To return to the editing screen, you will just need to click the Esc key. If there are mistakes or issues that you had noticed during the testing, you should fix them before saving the PowerPoint as just a presentation. The issues that you run into will depend on your presentation. One of the most common issues that people run into is that their Hyperlinks are not taking them to the right areas of their presentation. If this is happening, you should check the link by selecting the text or image and clicking on the Hyperlink option in the toolbar. This will show you where the link is taking you and you can fix it by adjusting the file, link or slide and then clicking OK. When your dashboard is working correctly, and all the information is on the slides, you can save it as dashboard software. This is done by saving the file as a presentation only. The file type will depend on the version of PowerPoint that you are using. Figure 6, below shows a sample PowerPoint dashboard. As already suggested, you can use DataPoint to link your PowerPoint shapes directly to data sources. The advantage of using DataPoint, or of linking slides to your databases, is that the information on your slides is updated automatically when you open the presentation. There are no more delays for manual updating of the old presentations. Other than the update of the data when the presentation is opened, Datapoint provides another great feature; you can create up-to-date snapshot presentations for distribution. And finally, you can run your presentation as a slide show and all its content is updated in real-time. You can hang a television screen in your factory or meeting room, or even the reception or lobby area, and display your dashboard data, graphically and in real-time.